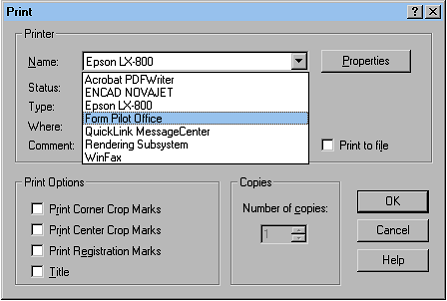 Form Pilot Pro is basic From Pilot software for filling out paper and electronic forms on your computer instead of using a typewriter. Filling out electronic forms: Form Pilot Pro also allows you to fill out electronic forms of any type (DOC, TXT, XLS, PDF documents, etc.) using Form Pilot virtual printer. Recommended for using at home and in office, since the program is suited for working with larger quantities of documents. You can use fonts of different sizes and colors, rotate text, insert pictures, checkmarks, and even erase unnecessary text from your form. After you have completed your form input, you can save it to your hard drive or a CD, print it out for mailing, or open it and change something if you need to. You may use preprinted forms (just the text will be printed out) or blank paper to create your completed form. Please see our cartoon. Filling out electronic forms: Form Pilot Pro also allows you to fill out electronic forms of any type (DOC, TXT, XLS, PDF documents, etc.) using Form Pilot virtual printer. Recommended for using at home and in office, since the program is suited for working with larger quantities of documents. Qweas is providing links to Form Pilot Pro 2.33.1 as a courtesy, and makes no representations regarding Form Pilot Pro or any other applications or any information related thereto. Any questions, complaints or claims regarding this application Form Pilot Pro 2.33.1 must be directed to the appropriate software vendor. You may click the publisher link of Form Pilot Pro on the top of this page to get more details about the vendor.